Something I read today brought me up sharp: ‘And isn’t the whole point of things – beautiful things – that they connect you to some larger beauty? … if a painting really works down to your heart and changes the way you see, and think, and feel, you don’t think “Oh I love this painting because it speaks to all mankind”… (you love it because) it’s the secret whisper from an alleyway. Psst, you. Hey kid. Yes you. I was painted for you.’ So said one of the unforgettable characters in Donna Tartt’s The Goldfinch. And so I think it is with great performances, they seem to speak to you, not in generalities or technicalities, but in something you know you will treasure, that you were meant to treasure. This thought prompts my Gigs of 2013, some of which I have written about in this blog. There was a late night set at Cheltenham in May, a good piano and the best of Edition – Dave Stapleton, Marius Neset, Neil Yates and Daniel Herskedal. A sublime hour, made memorable by the obvious weariness of Marius, gently swaying on his feet (he had had a very long day of an earlier gig in Brighton), and yet transcending that exhaustion with the most beautiful sounds, not the full-blowing Marius we knew, but a more delicate one. Afterwards, when I saw him in the foyer and briefly thanked him, saying his performance had moved me, he listened so attentively and humbly, as if I had something of value to say. I will never forget that moment. At the sight of Chris Bowden walking up the stairs at Stratford Jazz in September, all anxiety of whether he would turn up vanished, he looked so happy. For two hours he scampered around the stage like a court jester with a saxophone, wittily and wholeheartedly commenting on the other musicians around him, all signs of illness and weakness forgotten, just glad to be on the stage playing music he loved. To celebrate the evening, Chris had burned what he called a bootleg of his earlier performances with Stratford Jazz, tracks by Monk, and Brecker and friends. Because it meant so much to him, the gig meant much to everyone who was there. A beautiful duo between Dave Stapleton on a Steinway and Neil Yates on trumpet at St Georges Brandon Hill in February, a reworked Henryk. In the clear cool surroundings of that venue, we heard the music afresh. The video below is from the track on the album Flight but its heartbreaking beauty was rendered human by Dave and Neil on piano and trumpet. Obviously I must mention the launch of Maciek Pysz‘s debut album Insight at The Forge in May. Not only is this my album of 2013, I think it is quite possibly my gig of the year, its beauty took me by surprise. I could not wait to get the album home and into my heart so I could conjure it up in my memory whenever I want to. The whole occasion was full of joy, of connection between musicians and with us. It’s why you make the effort to turn out for live music, that somehow, the very act of your listening is adding to the experience of everyone else, that it has mattered that you are there. And as I end 2013, I eagerly anticipate next year – already tipping Reverie at Schloss Elmau by Gwilym Simcock and Yuri Goloubev (on ACT) to enter my albums of 2014 and no doubt that will be reinforced by seeing them live next year. And at Stratford Jazz we host what I am calling A Festival of the Guitar– starting with TG Collective, then John Law’s Boink! (which has a guitar), Maciek Pysz and finally Phil Robson. Different styles and temperaments, but all capable of conjuring up beauty and enhancing my life in unexpected ways. Thank you everyone I have heard this year, you have made that connection. I was wondering how to sum up the feelings prompted in me by this interesting new album. On Twitter I posted one word – sublime. I think I have another three words inspired by Shakespeare ” …a dying fall”. If you never knew what that meant, then listen to this album and you may find they make sense. This album is the latest from the Edition mine of beautiful music. The cover is lovely, the CD itself is a work of art with delicate snowy patterns on it. Norwegians Daniel Herskedal on tuba and Marius Neset on saxophones are supported by the Svanholm Singers from Sweden. This is not just everyday Scandinavian melancholy, no there’s humour and playfulness here, wistfulness and peace within its forty minutes. It creates a very special mood, not one to easily classify, not least because of the unusual pairing of instruments. I think it will grow on you. Most of the compositions are by Daniel except for The Wedding by Abdullah Ibrahim. Marius literally blew us off our feet last year with his Golden Xplosion tour and album. He’s spellbinding in performance, you can feel heat, there is so much energy in the room emanating from him. His saxophone seems to float, it’s a living thing almost. I recently saw him at Pizza Express where he surprised even himself at the tempo he played City on Fire, blisteringly fast. I also saw him at St Georges Brandon Hill (see my review of Dave Stapleton’s Flight) where he revelled in the perfect acoustic. But it’s not just technique or virtuosity you remember with Marius, it’s passion and fire, the sheer joy of performance. 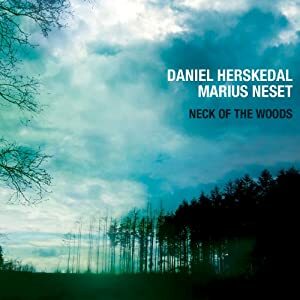 The first and title track Neck of the Woods will leave you spellbound, Marius and Daniel have created a piece of heartbreaking beauty. The gorgeous swoops of Marius’s sax, the feather-light tuba supporting it, the voices, some subtle electronics – they all work together. Eg er Framand shows off the beautiful solo voice of Hallvar Djupvik. If I can trust an online translation of this song it is “I am a pilgrim who will stay only one night here. I seek the City of God where sorrow & death are no more. Dear Lord, lead me to Heaven’s shore.” So I feel a bit more comfortable with my initial impression of this album, it is a bit melancholy and full of lamentation. But it’s balanced by some pastoralism and the magic we heard on Golden Xplosion’s Angel of the North (about a fjord) we hear on this album. If Golden Xplosion was urban, then this album is pure Norwegian fjord. The light, clear voices of the choir add to the feeling of space, coolness and echo. The Christmas Song’s haunting melody will be part of my Christmas from now on. If I need snow and moonlight on Christmas Eve, here it is in this charming composition by Daniel. The final track, The Wedding by Abdullah Ibrahim, is played so delicately and ends so gently, you wonder if you are dreaming. Here is the dying fall I started with, it just floats off into the distance, leaving you to savour a very pleasant feeling of Scandinavian melancholy. You can see Marius and Daniel at the Edition Records Festival at Kings Place on Sunday 16 September 2012 at 2pm. I cannot wait! You can also see them at St Georges Brandon Hill on 17 September and at Dempseys in Cardiff on 18 September (supporting Asaf Sirkis).